Is Unbounce your landing page builder of choice? 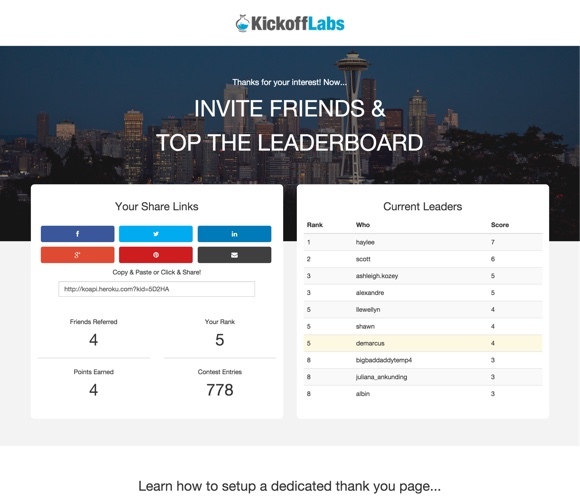 KickoffLabs AnyForm for Unbounce is a script you can copy & paste onto any Unbounce landing page to unlock features that will help you do better marketing. Build your custom form in Unbounce and KickoffLabs AnyForm widget will automatically capture any custom form fields. Post-conversion “Thank You” pages present a valuable opportunity for driving leads to take further action. Now you can chain your Unbounce landing page to it’s own, dedicated, thank you page to deliver digital bribes & incentives, offer referral sharing based rewards, or to increase your campaigns virality. What are you waiting for? Turn your current Unbounce page into a viral engine!